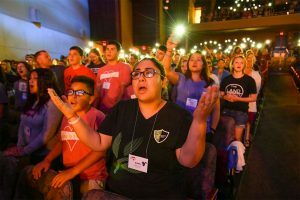 We are pleased to share the list of equipping seminars that will be offered at MennoCon19. Most youth seminars will be offered twice while adult and intergenerational seminars will be offered once. Youth sponsors, we have several seminars especially for you. Parents are welcome to attend sponsor seminars as well. A Spanish language seminar will be offered after delegate session each of the three full days of convention. The purpose of Equipping Seminars is to equip youth and adults of Mennonite Church USA for witness, formation, discernment, and leadership. align with the vision of Mennonite Church USA and the Journey Forward Renewed Commitments. are interactive learning experiences that introduce practical tools, skills, habits or frameworks that participants can take home and put into practice. appeal to multiple constituencies within Mennonite Church USA. are led by a person with expertise in the topic. We are also looking for seminars that can be presented in Spanish or another language.